I found myself looking at my outfit this morning and humming this to myself….’second hand Rose’. I was wearing a skirt from a boot sale (£1), a top from Ebay (£2.50) and a pair of boots, again from a boot sale (£3). My outfit also includes a cardigan from the charity shop (£2) and my daughter’s old black coat (not trendy enough for her!!). My underwear was new to me. I draw the line at second hand knickers, but would wear a second hand bra if it was in good condition. So, for the princely sum of £8.50 I was ready for the office. I really don’t think my colleagues would have guessed (in fact I got four compliments on the top!). When you know you can buy decent quality clothes in pretty good condition for a few pounds, it becomes difficult to justify £20 or £30 on a single new item. Especially when you are strapped for cash. Being a second hand Rose becomes addictive. I think it is in my genes, as my mother is Queen of the Boot Sale. As a pensioner, she rarely buys any clothing from new. It becomes an adventure to see what you can find. 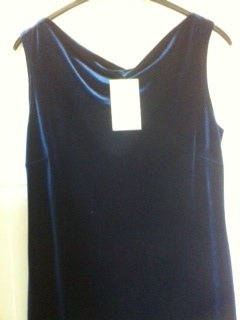 I regularly come across great quality brands in the styles I like for just a few pounds. Per Una, Laura Ashley and Monsoon, to name a few. By buying second hand clothes, not only do you kit yourself and your kids out for next to nothing, you are recycling! You are also supporting charities or helping other cash strapped people by buying their unwanted stuff. Everyone’s a winner. I would rather wear rags than rack up more debt, but fortunately I don’t have to. I am committed to being as frugal as possible in order to pay off my credit card and make my mortgage payments every month. Buying lots of new clothes is out of the question. 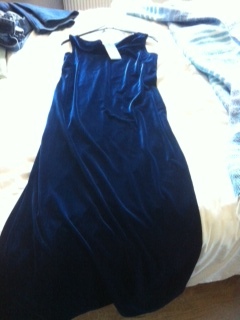 My most recent bargain was a beautiful blue velvet cowl necked dress, originally from Dorothy Perkins. I got it in the local hospice shop, reduced from £6.75 to £3.50. I am hoping for some invitations to a few Christmas parties to give me the opportunity to wear it now – what do you think? What have been your best clothing bargains? Are you a second hand Rose?